The best comfort, also at low temperatures Martin, the men's jacket by Erreà is made of resistant fabric and has a ribbed edge to protect you from all weather conditions and preserve the heat of your body on cold and windy days. The high collar and buttons provide a comfortable and soft covering in any situation, before and after the competition. You will certainly enjoy the front pockets, that provide additional space for your most important belongings. The full-length zipper is very useful to take this garment on and off comfortably. Materials: Piquet. This is the heavier fabric with a slight stretch. Front - embroidered UEA crest, back print 'uea-sport' plus choice of club name. 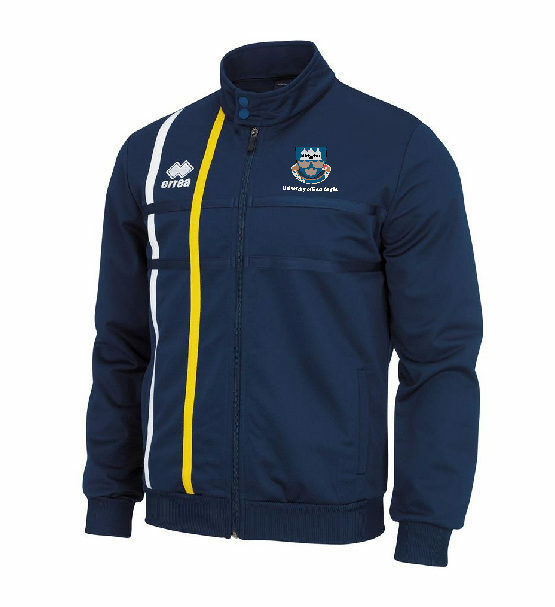 The Errea Flann Track pant will go well with this track top. Please note that once this garment has been personalised with the club name it is non returnable. Samples are available from the Sportspark office to ensure correct sizing. WASHING: We recommend that all UEA garments are washed at no more than 30 degrees and please do not use fabric conditioner. It's better for the environment and prolongs the life of your garment.